The Oxford Farming Conference is recognised both nationally and internationally as a leading think tank for global agriculture. The 2019 Conference runs from 2-4 January. Our scholarship programme, which has been running for well over two decades, gives the next generation an opportunity to be “informed, challenged and inspired” and to make connections that will help them to be more effective in their own careers. Many past scholars have gone on to take leading roles and made valuable contributions to the industry. As well as the conference, we recommend Scholars attend the TAP Social and Christ Church dinners, as this is where they get a chance to meet with other delegates and discuss the industry and subjects raised at the conference. We also try and keep the Scholars together by having them stay at Christ Church. For the 2019 conference, we are developing the scholarship programme further thanks to the generosity and support of organisations and charities. We therefore encourage scholars to register by 31st October 2018, where possible, so they can benefit from the full expereince. This includes a Scholar’s Day, hosted by McDonald’s on 9th November near Manchester. 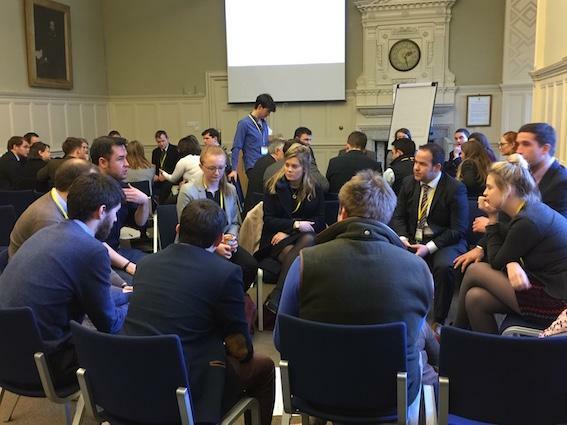 The Oxford Farming Conference Scholarship Programme aims to inform, challenge and inspire the next generation to serve the charitable objectives of the conference and to secure its long-term reputation and influence. • Desired age of 22 to 30 but exceptional candidates can be considered outside of this age range. • Candidates should not ordinarily receive a scholarship more than once. • The programme should welcome a mix of gender, sector, geographical and academic experience. International scholars are encouraged. This year we will be giving them additional training to make sure that they deliver more value back to you as their sponsor and to the wider industry. If you represent an organisation that would like to sponsor a scholar, we have a database of bright and enthusiastic prospective scholars who are waiting for an opportunity if you would like us to select one for you. Or if you have a scholar in mind already, we'd be very happy to include them in the OFC Scholars' Programme, sponsored by McDonald's. Arrive for the Oxford Farming Conference, Scholars briefing and workshop, live music and street food at TAP Social. Full Conference ticket – at the Early Bird price of £275.00 plus VAT or £295.00 plus VAT after 31 August 2018. This includes lunches, refreshments and admission to the Chairman’s Reception for Patrons, Sponsors, Speakers and Scholars. This also includes attendance at the Scholars Training Workshop and the Scholar’s Reception on the Wednesday afternoon. TAP Social Dinner - Wednesday 2nd January – An informal social enterprise venue with a band and street food style dining. £50.00 plus VAT. Scholars usually make their own way to the Conference but if you wish to offer a travel allowance, we suggest that you make these arrangements directly with the Scholar. You may also wish to provide help with travel expenses to the Scholar's Day hosted by McDonald's in November 2018. 2. Book their accommodation at Christ Church HERE. You must enter "FARMING2019" before you select the dates. 3. If you have registered your scholar by 31st October 2018, we will be in touch via email with more details about the McDonald's Day in November. Please note, we recommend including your Scholar's email address when you register so we can get in touch with them about the conference, invite them to register for the fringe sessions (inc. in their conference tickets) and keep the updated on the Scholar's programme. OFC Director, Sally Williams, is managing the 2019 scholarship programme.